I really liked Sunrise at La Costa because it was newer and smaller. The staff was very helpful and very nice, and they had a very good variety of activities. Everything was very clean. The room was a little smaller as well. The food on the menu looked very good. It's a very well-maintained facility. My father is at Sunrise At La Costa and it is very homey. The caretakers are very friendly and they don't have a lot of turnover. I really like it. The apartments are nice and it's a nice size. The place is not huge, but it's not tiny, and they try to encourage independence. They offer activities to the residents and they make them feel welcome. The food's very good. I think it's a good value. So far so good; we've heard a lot of great things about Sunrise at La Costa, and my mother-in-law is just settling in and has only been there since last Monday. It seems to be working out so far, and she's in the memory care section. I liked the facility, and they're very close to where we live; that helps. It seems to be very well-kept, and it's a very pretty facility. It's active and clean, and the attendants seemed very attentive and answered all of our questions. It was comparable in price also. The place we liked the best was Sunrise at La Costa. My favorite part of it was the person that showed us around was very bubbly and friendly, and there were more people congregated in little groups. There was more happiness going on for me, and the people really looked happy. The rooms weren’t as big. My son has gone there several times to do cooking shows ,and he says he invites the guests around to watch. Everybody gets to taste everything, and they make it a big deal. They had movies every night, and they had people come in and teach. The director at Sunrise was very personal, thorough, and was in contact with the residents while going through the tour. It was pretty high-end in as far as activities and stimulation, and I felt like some of the programs were more than what my mom would be able to handle. They did do a nice follow up. They had a lot of amenities, and they had a library and a pool. Everyone at Sunrise is very nice, professional, polite and caring. They all go the extra mile. The interiors are lovely. It took us over six months to get my father in law to go into the facility. The sales staff, Sally especially were very patient, gave me a lot of advise. My 93 year old father in law is now very happy in his new home. He is also now only five minutes from our home. Great place. Sunrise was beautiful. Everybody from the manager down to the staff was so friendly. It seemed like a really good place to be. However, that's $3,500 or $5,000 a month for my dad. My uncle is in Sunrise. It is an excellent facility and a luxurious place. It is clean and we are very satisfied because he is happy there. My visit at Sunrise at La Costa was excellent. The woman in-charge was very informative and helpful. She knew that we would not be able to choose their facility, but she was very helpful. The people there were very nice. Sunrise is lovely, very large and clean. The Sunrise assisted living is fabulous for someone who is social throughout their life and they don't mind a big social environment. The staff was very nice. The residents seemed happy there but it wasn't appropriate for my mom, it just seemed larger than I think she would accept. My mom needed to be in an environment where there are less residents not a hundred. I think it depends on the individual. The facilities were pleasant over all. The location of the area is rather ideal for elderly residents, as it is very close in proximity to various shopping centers and entertainment centers. For example, directly across the street from Sunrise Assisted Living in Carlsbad in a shopping center, the contains a grocery store, movie theatre, some small boutiques, ect. The only down side of this, is that because the location of the Assisted living center being right next to this shopping center, there is always a lot of traffic and noise, which I would say is the main downside to this facility. The facility itself is very nice, with a lobby and restaurant area for residents and family members to visit with one another. There is always handicap access throughout all parts of the facility. There is a nice garden area outside as well, and the residences are always decorated festively during the holidays. When I visited the facilities as a volunteer, I was under the impression from the various people that I talked to that they were generally happy living here. Overall, I would say that Sunrise Assisted Living provides an adequate facility for assisted living. Initially, I had to meet with the head of the entire facility in order to volunteer. Once I had met with her, I was officially approved. Most of time time I spent there consisted of running errands and talking to the elderly along with all of the other volunteers. I remember the facility to be very nice, it had a nice spacious dining room with a old cafe-like feel to it. There was a "house" dog that would kind of just run around and circulate through all of the residents, playing and giving them joy. All in all, I enjoyed my time there, and it definitely seemed like the residents were comfortable and not distressed to be living there. The appearance of the facility was modern, but also old-fashioned at the same time. The dining room had a great grand piano in the center, which was played during lunch and dinner. The facility also had a resident dog, which would cycle around the building and socialize and provide valuable interaction with the elderly. In the back of the facility, there were many beautiful walkways in which elders could stroll and get fresh air. The facility offered many classes such as water aerobics, arts and crafts, etc. The home had rapid transport shuttle services to local hospitals in case they were needed. Overall, my 12 hours at the facility were very enjoyable; it was refreshing to see that the many elderly people living in the facility were surrounded by a healthy environment in which they could keep their spirits high. 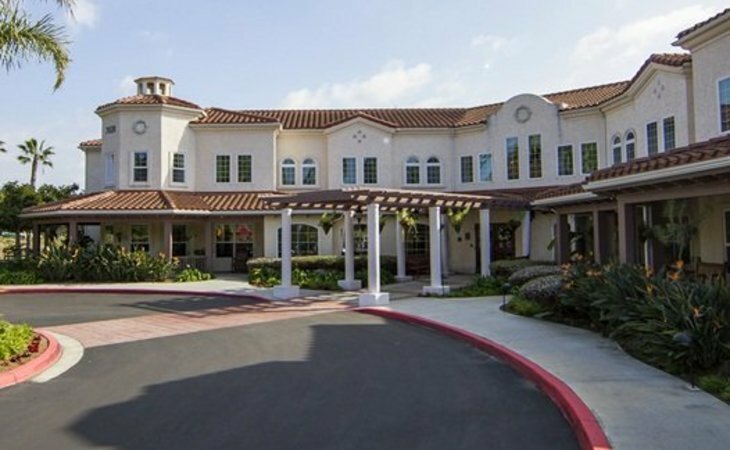 Sunrise Assisted Living in La Costa is a beautiful facility, inside and out, that provides great care and many amenities to their residence and their family members. The staff such as the of caregivers, medtechs, and nurses comes together to provide the help requested by residents and their family members. At Sunrise their are many daily activities (arts&crafts, aerobics, spanish classes) along with trips around town every other week. The kitchen, known for the awesome chef, serves three meals a day which the residents can take to their room or join other residents in the dining room and provides a private dining room for special occasions. Located approximately one mile from the Pacific Ocean between La Costa Resort and Spa and the Four Seasons at Aviara, Sunrise at La Costa Assisted Living community in Carlsbad sits just 30 miles north of downtown San Diego, California. We pride ourselves in the high quality of care we provide. Sunrise at La Costa is an environment that enhances each resident's unique abilities. Step into a Sunrise Assisted Living community and you can't help but feel at home. Sunrise at La Costa will stop at nothing to make your experience warm and inviting, from our homelike exterior architecture to our comfortable community areas and choice of suites to our exceptional outdoor gardens and landscaping. Look around and you'll notice fresh flowers throughout the residence, and you may even spot our dog or our cat. And of course, there are always the friendly smiling faces of the Sunrise staff to ensure that each day spent here is a welcome one. What should caregivers and potential residents know about Sunrise at La Costa?